Yishai Schlisel, the chareidi man convicted of the murder of Shiri Banks, who was 16 at the time, during a Jerusalem toeiva parade a number of years ago, is once again in the news. Regarding Banks, ironically, she was not a parade participant, but looking on. Schlisel, who portrays himself as being chareidi, was sentenced to life in prison plus 31 years. 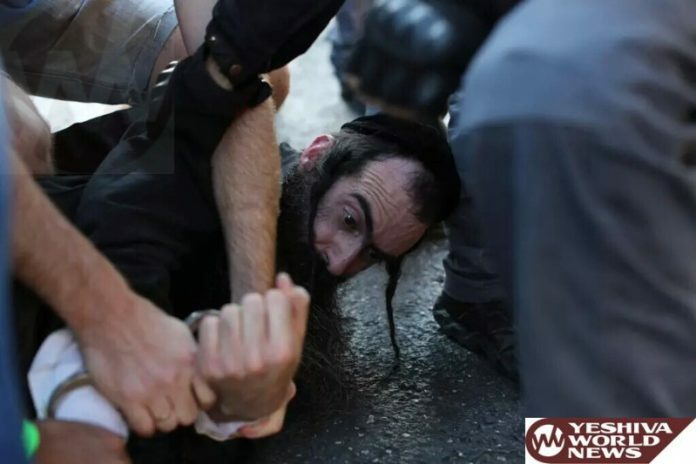 In his latest distorted battle for Yiddishkeit, he blocked a female Israel Prison Service (IPS) officer from entering a shul in the Torah Wing of Ayalon Prison, during a ceremony to complete the writing of a Sefer Torah. Schlisel insisted the officer was not dressed appropriately, and therefore, he decided she may not enter. According to the report filed by Jackie Edmoker of Walla News, Schlisel ask that she leave the shul, adding prison officials report Schlisel told her she was not dressed appropriately, and her attire lacked modesty. Another prisoner, who together with Schlisel objected to the officer’s entry to the shul, was sent to a waiting cell until his disciplinary hearing for his offense and will probably be sent to solitary confinement for a period of time. Another G-d’s policeman. Let him rot in solitary. If she was attending the ceremony, and was in the women’s section, at most his complaint that the women’s was too visible from the men’s section. He killed a woman. What mishkav Zachar was he standing up for? shimen, there is not ONE WORD IN RABBINIC literature about a BD condemning someone for mishkav zochor; plenty of words and the use of a Kuppoh. i cannot even recall a physical punishment given EVER for MZ. think about it. but if you killed someone – welcome to the Kuppah. Insane or heretic or both? adultery or killing a parent? We’re supposed to fall for being ” just police incompetence”? So it’s official now?officially out of the Bible ? Rather than allow you guys to keep pushing the envelope it’s overdue for us to push you guys out! listen mr ignoramas…you dont know torah law and you come over here to support these sodom behavior??! AND THIS IS NOT RABBINIC…its torah ball peh…and if you dont believe in torah ball peh what you doing here?? where did you read that we support his murder..wheres your reading comprihension. I had forgotten that EY no longer executes these animals but allows them to roam freely within the prison system. The prison guard should have delicately provided a knee in the groin to remind him he is fortunate that EY abolished capital punishment for murder. Its unbelievable he is given an opportunity to complain about anything. On what basis are we calling this fellow a Chareidi Jew? Not attempting to whitewash or justify murder in any way, but it’s fairly obvious that Shlissel is probably psychotic. It’s likely he belongs in a mental institution, not a regular prison. There was a consesus (conspiracy??) to rule him “competent to stand trial” — because the prosecution desperately wanted to make an example of him, to “send a message.” Ruling him mentally incompetent would not allow the medina’s agenda from being carried out (life in prison). Hence, he was considered mentally competent to stand trial. And now he’s in a regular prison instead of where he really belongs. We ought to judge him accordingly, even if the medina has not. the level of am’haratzes is too great for me to even try to explain. Like most who cannot deal with facts, your first resort is to make ad hominem assertions. If you cannot distinguish what was said versus what was done, you are probably not to be able to read let alone understand. have a nice day. Banks was a toeiva supporter who went to the parade to support the mishkav zochirniks. This was never in doubt and her family admitted as much openly. We actually understand you and your kind loud and clear ! should we give you some benefit of the doubt and presume that you don’t understand yourself? Joey…..Whatever the reason Shiri Bank A’H, happened to be there watching the parade has ZERO relevance to her right to be there and not live in fear from being butchered by some animal dressed up in Chareidi lvush. For the same reason a female prison guard has to enter the shul dressed in her official work uniform without that same animal commenting on her appearance or right to be there. Your trolling post implying that there was some guilt by the victim because she was at the wrong place is beneath your normal contemptible comments. He is a holy holy man. He gave me a blessing and it worked big time. all those that are attacking him should ask themselves – what would you do when your granddaughter tells you she is engaged to her girlfriend? blame muslims for their terrorist cousins? 1140 Mack….If this murderer gave you a “blessing” than you probably should be saying tehillim because its more likely going to end for you badly. daas torah: thanks for the musar….I’ll also be careful never again to use the term daas torah to stand for anything consistent with yiddeshkeit. And yes, her life is worthy of an A’H and every time we see any reference to that animal Schlisel rotting in jail, it will remind us of the mistake EY made in abolishing capital punishment.